Before the official 50th Anniversary Ceremony and festivities begin on July 4th, enjoy a celebratory lunch in the Liberty View Ballroom at the Independence Vistor's Center. 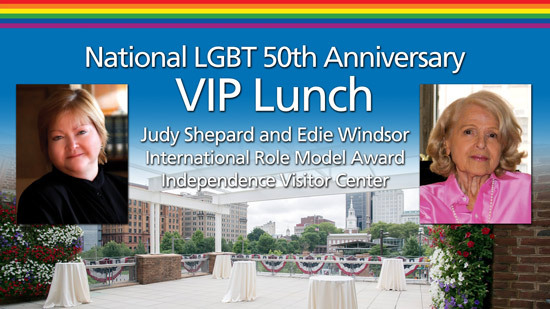 Judy Shepard and Edie Windsor will receive the 20th Annual International Role Model Award. Jack Ginter is senior managing director and executive vice president of Abbot Downing, A Wells Fargo Business. He serves as the senior regional managing director for the organization, overseeing all five regional managing directors, the National Planning Practice, and the Family Dynamics and Education team. Ginter has a long history in the banking industry in both corporate lending and wealth management. He joined Calibre/Wells Fargo Family Wealth in 2008 as the regional managing director in the Philadelphia office. In 1998 Judy and Dennis Shepard lost their 21-year-old son, Matthew, to murder motivated by anti-gay hate. Determined to prevent others from suffering their son’s fate, they established the Matthew Shepard Foundation to champion social justice, diversity awareness and education, and equality for LGBT people. As the founding president, Judy Shepard also served as the organization’s executive director until 2009. Originally trained as an educator, she speaks at engagements in the U.S. and abroad about how individuals and communities can make the world a more accepting place for everyone—regardless of difference. In her 2009 memoir, “The Meaning of Matthew,” she explores her family’s journey through the prosecution of her son’s assailants and the ensuing media coverage as well as their continuing work to advance civil rights. Mike Stack is Pennsylvania’s 33rd lieutenant governor. He was elected in November 2014 and inaugurated along with Governor Tom Wolf on January 20, 2015. In addition to presiding over the Pennsylvania Senate, he also chairs the Board of Pardons and was appointed by the governor to chair the Pennsylvania Emergency Management Council. He is a member of the Pennsylvania Military Community Enhancement Commission and was chosen chairman by the other commissioners. He also chairs the Local Government Advisory Commission. Tony Williams is a Pennsylvania state senator of the 8th District, one of state’s most populous. He serves as the minority whip, the Democratic chairman of the State Government Committee, and is a member of multiple other committees. He also sits on the Pennsylvania Council on the Arts and various community boards. Williams entered politics at age 31. He served as state representative for the 191st District before becoming a state senator in 1998. He is a 2015 Philadelphia mayoral candidate.